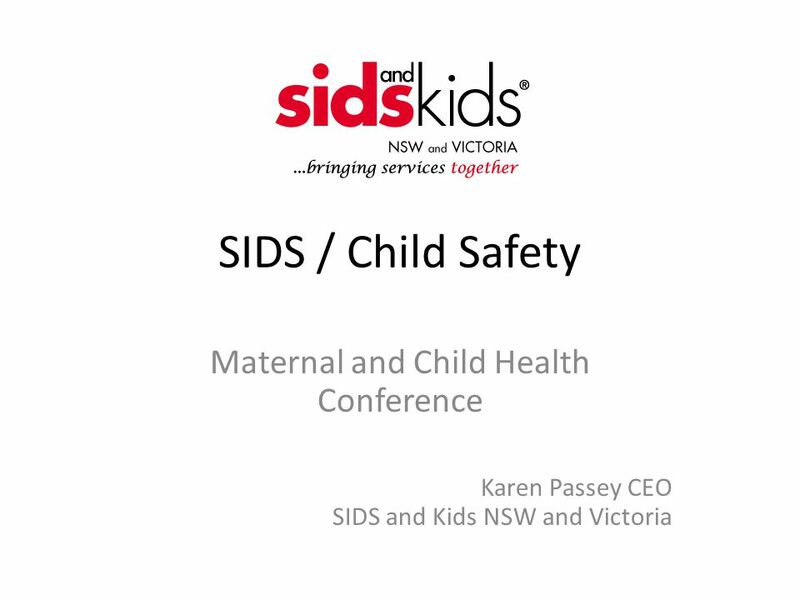 SIDS / Child Safety Maternal and Child Health Conference Karen Passey CEO SIDS and Kids NSW and Victoria. 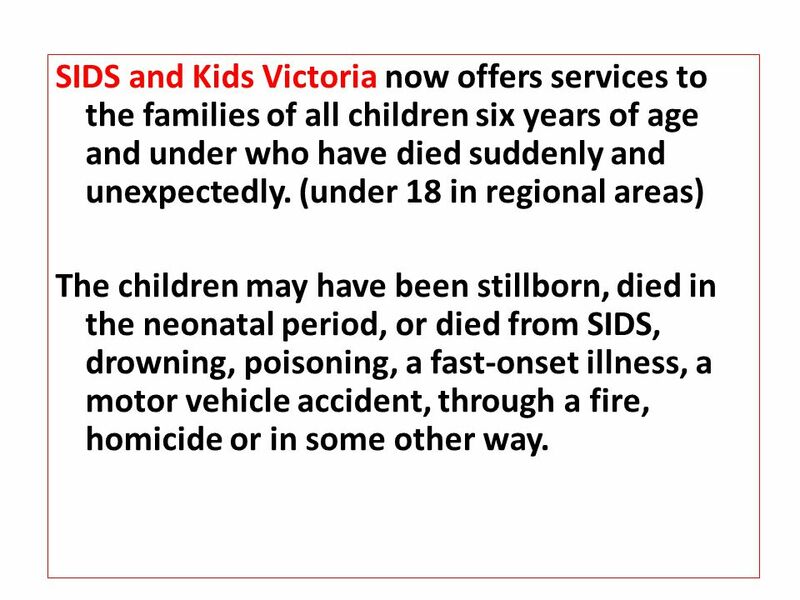 9 SIDS and Kids Victoria now offers services to the families of all children six years of age and under who have died suddenly and unexpectedly. 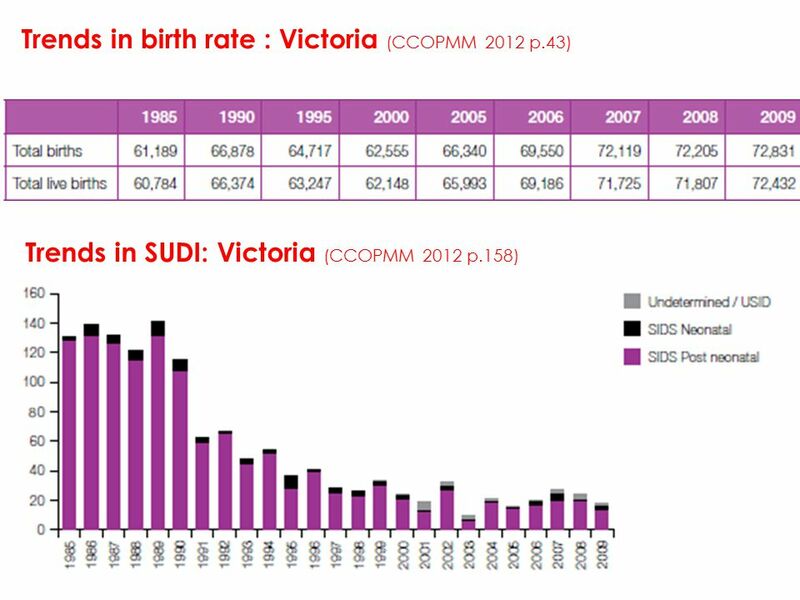 (under 18 in regional areas) The children may have been stillborn, died in the neonatal period, or died from SIDS, drowning, poisoning, a fast-onset illness, a motor vehicle accident, through a fire, homicide or in some other way. 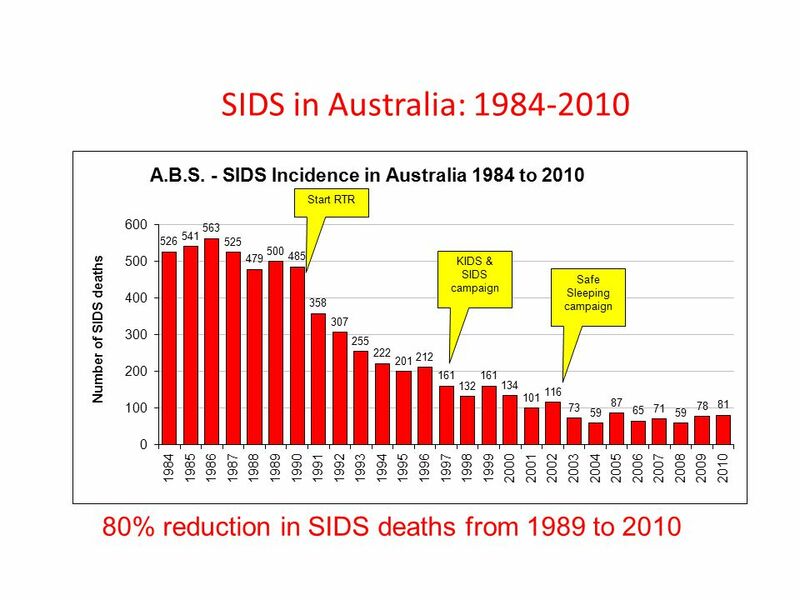 Download ppt "SIDS / Child Safety Maternal and Child Health Conference Karen Passey CEO SIDS and Kids NSW and Victoria." Health Promotion Health People 2000 By Kathleen Giuntoli. Examining Child Fatality Reviews and Cross-System Fatality Reviews David Kelly, J.D., M.A. 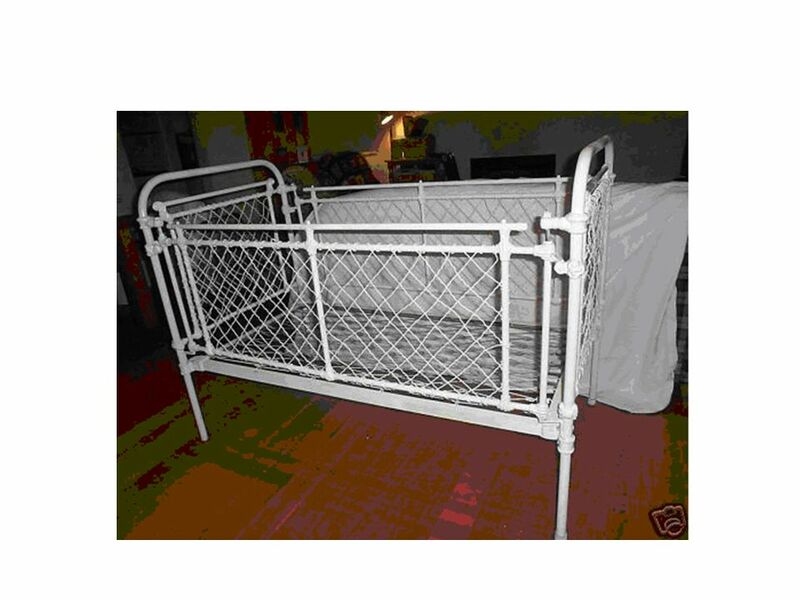 Childrens Bureau Liz Oppenheim, J.D. Ying-Ying T. Yuan, Ph.D.
Adina Ekwerike, MPH Health Program Manager Philadelphia Interdisciplinary Mortality Review Thursday, May 18, 2006 Understanding and Preventing Infant Deaths. 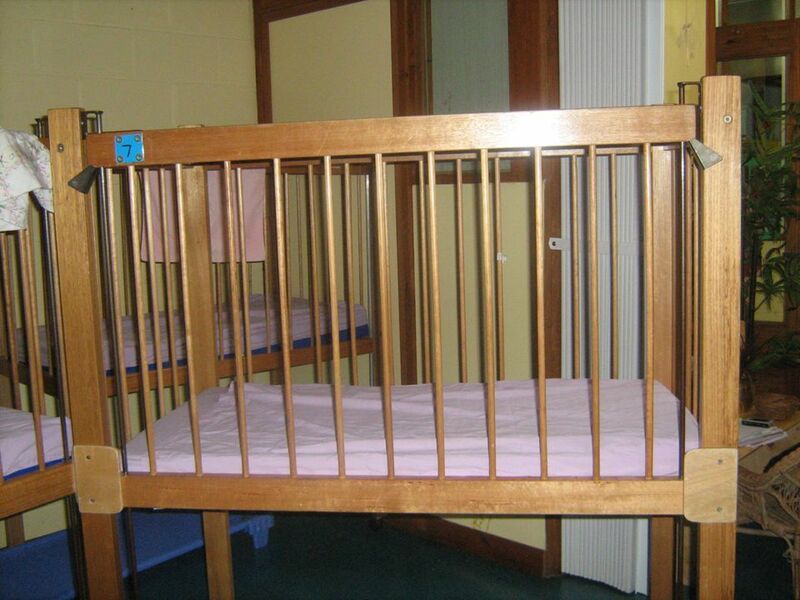 1 Step One: Know the Regulations: EEC Infant Sleep Regulations In Family Child Care and Group Child Care Programs: Children younger than six months of. Healthy Under 5 Kids Program presentation Child and Youth Health 2011. 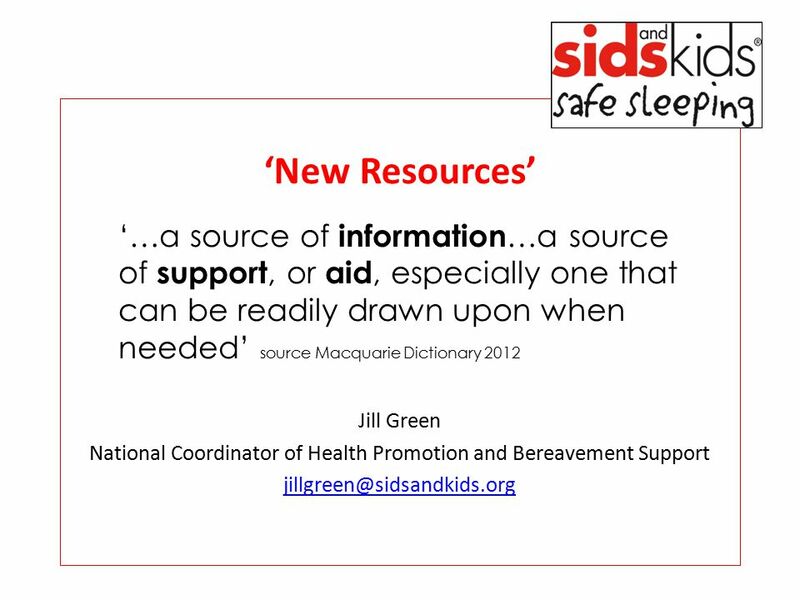 SIDS AND SAFE SLEEP INFORMATION AND PREVENTION April 2009. 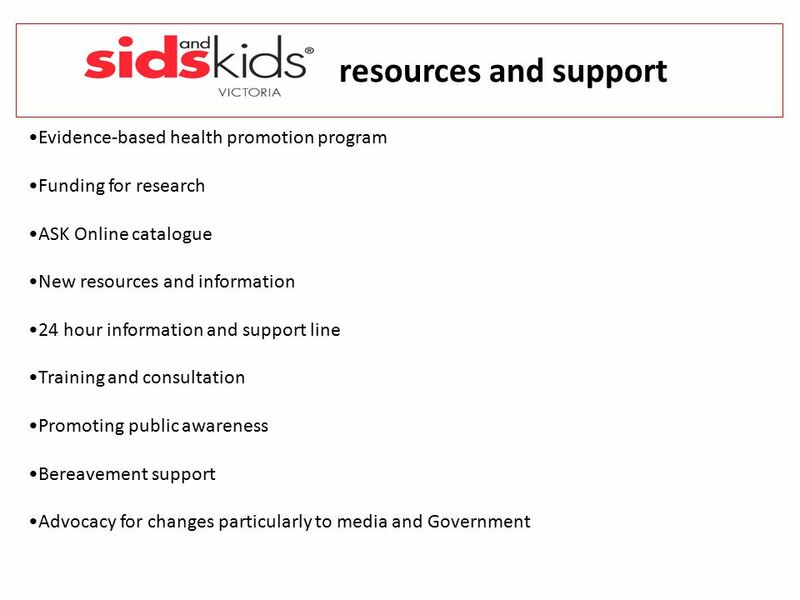 What we have achieved in Victoria… Emergency response Policy Increase number of presentations and reach average of 3000 health professionals per year Childcare. ABOUT MAE TAO CLINIC. MTC was founded in Mae Sot, Thailand in 1989, by Dr Cynthia Maung, an ethnic Karen doctor who fled from the violent student crackdown. 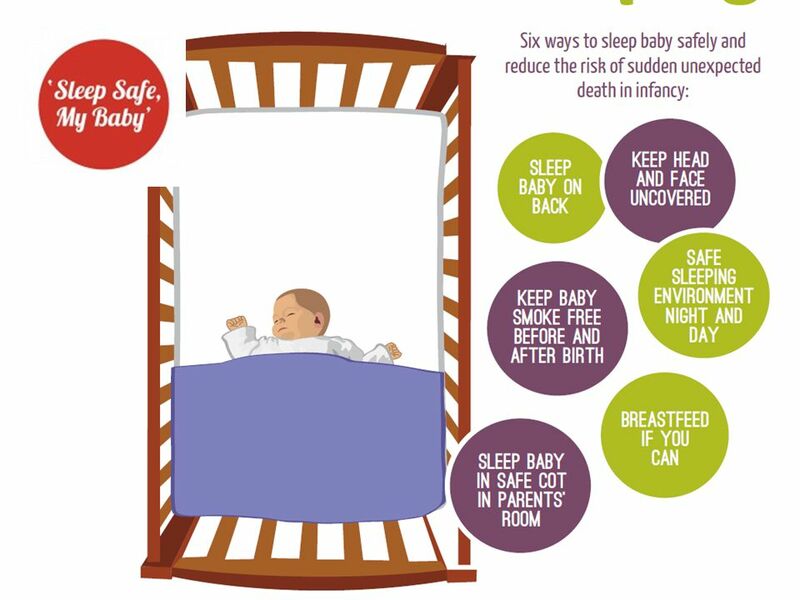 EEC Safe Sleep Campaign Reducing the risk of Sudden Infant Death Syndrome (SIDS) by working to ensure that every sleep is a safe sleep. 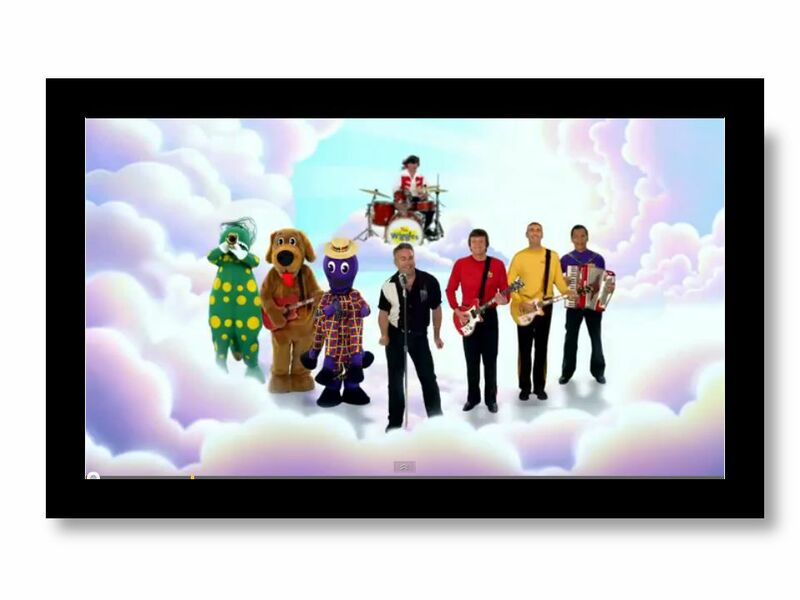 Every Week Counts Learning Collaborative Infant Safe Sleep Workgroup. 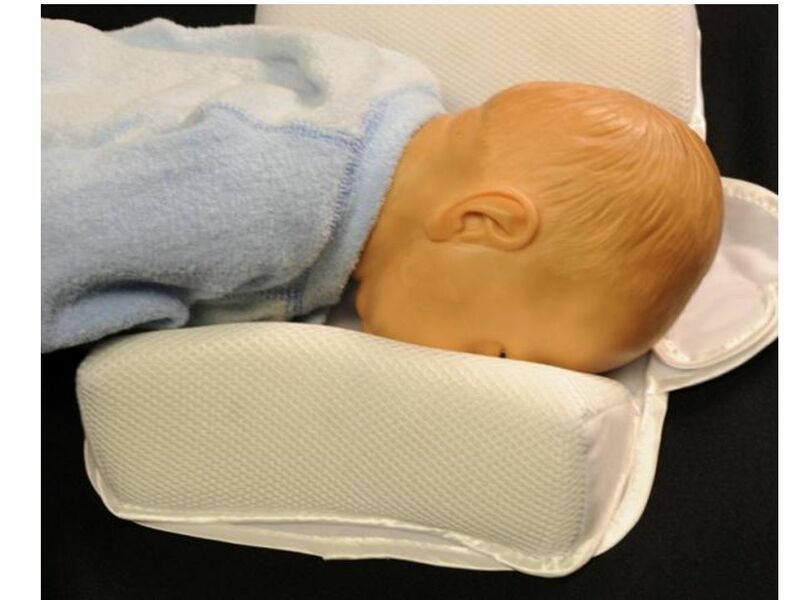 SIDS - Sudden Infant Death Syndrome American Academy of Pediatrics – Policy Statement The Changing Concept of Sudden Infant Death Syndrome: Diagnostic. 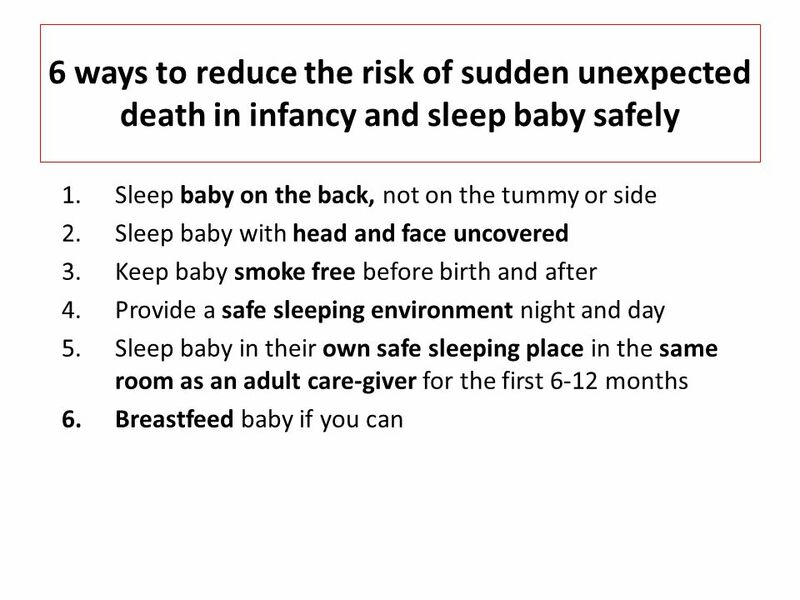 Sudden Infant Death Syndrome FIRE TRAINING DIVISION. By Josh Gerber & Jessica Snyder. 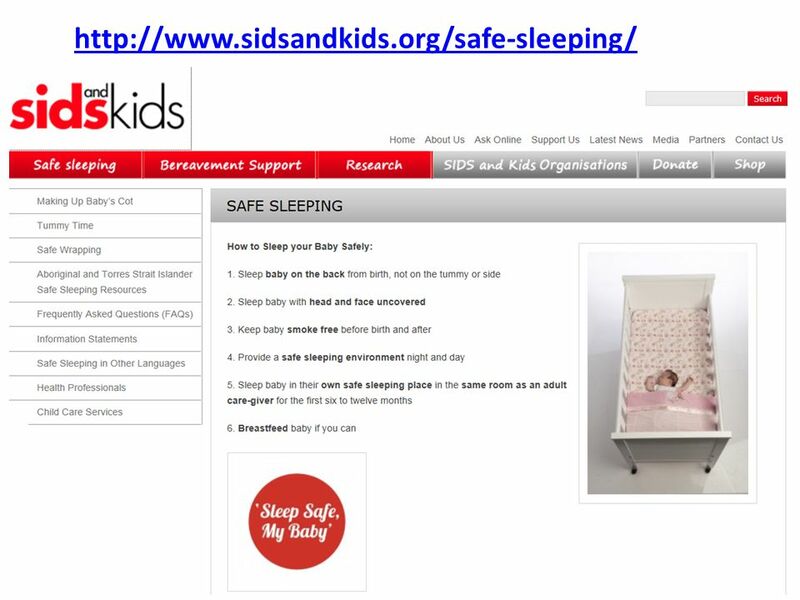 What is SIDS SIDS stands for sudden infant death syndrome SIDS isn't any one illness or disease. Approximately 2,500.